Not a coincidence. This sort of thing started happening last year, and i’m worried it’s bcause we went through the school door this time. Last year, see, we accidentally uncovered this sort of uber “quantum chocolate”, the eating of which done a big hole in spacetime, so it ended up being every christmas ever, all on one day. I’m worried there might be still a bit of that lurking around if even the Bu-Cannon is talking about us now. He can never be stopped, or e’er turned away from his goal. Let’s have a look for it. On the front of the calender the picture of the castle had doors all over the walls, so when you open the doors you’ll be able to see Snatter Classes! But we’re actually IN the Elf School now, so I bet we’ll go into the classes, and then SHOVE THE WALLS and they will open and be DOOR WALLS. so here we are running about looking for a room called ROOM TWO. Oh look! Look what’s happening in the main hall! omg! It’s a very sombre occasion! I’m describing it even though we can all see it! The boys are lining up and being given their SCHOOL CLOTHES. Now, some elf’s have come with their own clothes, like Duddles and that. But poor elfs whose parents don’t have much money are being given standard issue clothes, which are green. Snatter is having a bit of a grump about his elf clothes, because green is just not his colour. 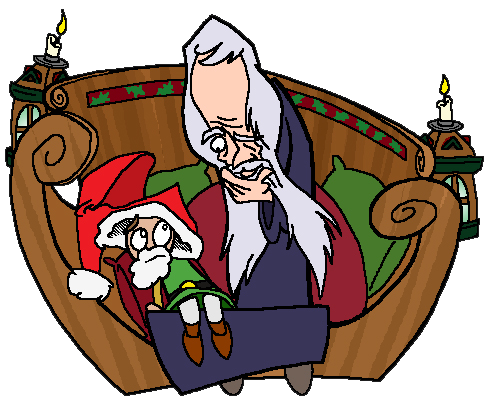 But it’s somber because Burgess Meredith, the great grand old great wise old Elfey man who is the head elf of everything – you know, the one who made Snatter have A Beard – is sitting in his great big grand reception chair, to greet the newcoming children and say a few words to them. But noe, he say things like this. That is a word in Elfish, it says in my Snatter book. It is elfish for gr8 m8s. You’d think it would be Elfish for “Elfen Bretheren” because they look a bit similar but no, that is an coincidence. The boys are then sent up to the chair and they sit on Burgess’ knee, and according to traiditon (I noe all this from my Snatter book), he goe “And what do you want for Christmas little boy?” and they go “I want to be an Elf!” and he goe “or maybe, even more.” because remember they’re on the lookout for a Snatter, a Chosen One. AND ONTO THEIR HEADS ONE BY ONE, burgess puts The Snatting Hat! My stitching’s made of splat. And if you look inside me there’s a pungent sort of air. And I do a bit of poo. Cause that would be well super if you were hee hee oh m8. For I’m a Little Thingy! A Thingy’s what I am! My brain is made of spam! I haven’t got a nose! he goe on like this for ages. Anyway he decides which one of them is snatter, and then keeps it a secret, because as well as being a magical hat, he im am bumhead. So I noe! Let’s pretend we elves, we can sneak into the line of elves leaving and go and follow Snatter to his first lesson.